Voces y Caras: Hispanic Communities of North Florida is an ongoing digital oral history project at the University of North Florida that engages heritage speakers of Spanish in developing questions and recording interviews with members of the growing Hispanic/Latinx community. The project explores the power of people's stories, seeks to make visible hidden communities, and enables processes of self-discovery by students of Hispanic/Latinx origin in the U.S. The community that this project examines is diverse and demographically complex. The interviewees come from Spanish-speaking countries in Europe, Africa, and the Americas. They occupy different roles; some are doctors, business executives, teachers, police officers, undocumented migrants, religious leaders, etc. Some have been in the U.S. for many years, and others came recently. Some escaped political repression and violence in their own countries, others came looking for a better future, and some came following their loved ones. They represent a vibrant, family-oriented, hardworking community whose members strive to achieve their goals and dreams. They have assimilated to North Floridian society while maintaining a strong cultural identity. This desire to keep their own culture, or to become bicultural, is nonnegotiable, because this varied group is extremely proud of its customs, food, music, language, and above all, of their families. The project began in the spring semester of 2012 when the students in Dr. Constanza López’s course Communication and Communities for Heritage Speakers of Spanish interviewed 24 members of the Jacksonville community. 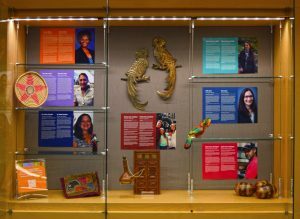 During Hispanic Heritage Month in the fall of that year, the Thomas G. Carpenter Library at UNF hosted an exhibit of the project. In this display, together with posters about the interviews, visitors were able to see a collection of arts and crafts from the Hispanic worlds. Since then, Voces y Caras has become an annual event that documents and highlights not only the growth of our community, but also its scope and impact. Over 150 interviews have been conducted, recorded, transcribed and archived, serving at least four purposes: (1) Recognizing immigrants as an indispensable part of our society in a political environment increasingly hostile to them, (2) putting students who are heritage speakers of Spanish in contact with their cultural and historical backgrounds, (3) giving these students the opportunity to recognize themselves in the stories of others, and (4) serving as a pedagogical tool that creates communities in and outside of the classroom. Voces y Caras is an affiliated project of the UNF Digital Humanities Institute, and is led by Dr. López, with support from Michael Boyles, graphic designer at the UNF Center for Instruction and Research Technology (CIRT).